The property is a first floor apartment with terrace. Each floor comprises 2 bedrooms, 2 bathrooms, open plan kitchen and lounge. Satellite TV, washing machine, stereo, DVD, Internet and telephone (ideal for working away) are provided. The property suits people from all age groups. 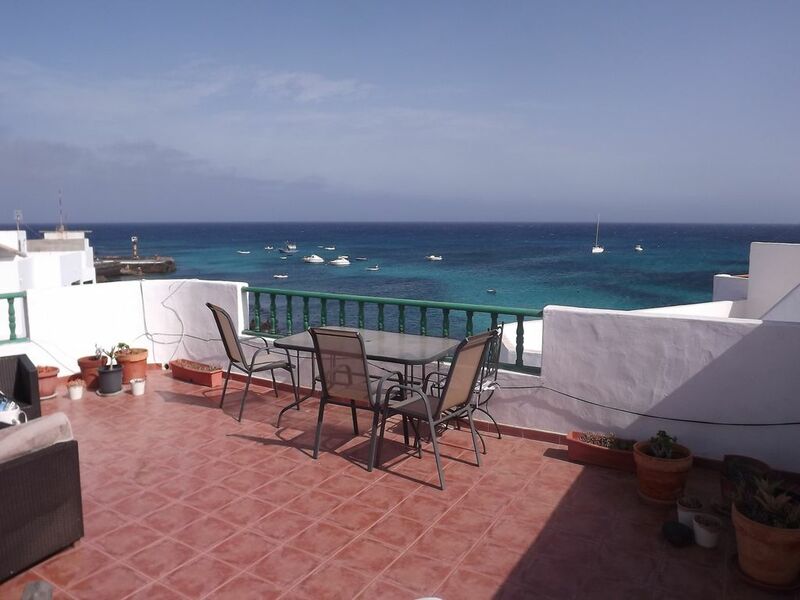 It has the character of a traditional Lanzarote property and the views are breathtaking. Punta Mujeres is a charming village with a superb local atmosphere. Fishing, sunbathing and swimming are just outside the front door. Shops, restaurants, cafes, supermarkets are all within easy walking distance. As you walk through Punta Mujeres you'll discover beaches with sea pools, sea front bars and restaurants, fishing pier, rocky coastline ideal for picnics and rock pooling. Football pitch, children's play ground, and many interesting sites are all nearby. The property situated in Punta Mujeres is ideal for people from all walks of life. It has the character of a traditional Lanzarote property and the views are breathtaking. It is a charming village with a superb local atmosphere. Fishing, sunbathing and swimming are just outside the front door. If you choose to stay in Punta Mujeres you'll never have far to go from the villa in order to spend each day on a unique beach, although many people prefer to explore the more rugged areas of coastline where tranquil coves and natural pools provide the kind of environment that is perfect for a truly romantic holiday. Within a 5 minute walk there are local bars and restaurants which cater for all tastes and budgets. The local bar is especially 'Canarian' where you can sit by the sea front with a beer or glass of wine for a euro or 2 and a choice of tapas for 2 or 3 euros. There are a number of mini markets, shops, take away cafes, and of course restaurants. If you fancy a day out the towns of Hariia and Teguise are nearby and are the capitals of the local municipalities. They are very interesting and Canarian. The drive from Punta Mujeres to Haria and Teguise is magnificent. Most water sports can be partaken in Punta Mujeres or nearby. Surfing is popular in neighbouring Arrieta. Swimming, snorkelling, fishing, are just outside the door. Walking and cycling are very popular as the local terrain is flat.
. The television is set up for terrestrial and satellite. There is also a DVD player. The telephone and internet is near the dining table which can also be used as a desk.The lounge is open plan and leads into the kitchen which is new and completely fitted. You have dishes, pans, cutlery, toaster, kettle, oven and hob, fridge freezer etc. There is plenty of cupboard space. The kitchen leads into a small hall for the main bedroom (br1) and bathroom. Bedrooms: The main bedroom on the left has a queen size bed and large wardrobe. The one on the right which is off the main hallway has 1 single and 1 double beds and also has an en-suite bathroom .The terrace has a terrace room with a small working kitchen. The kitchen is fully equipped with glasses, dishes, pans, small fridge, etc.There is also a wahing machine. Outside there is a large terrace overlooking the sea with table, chairs, loungers, clothes airers, and umbrella. Street parking 50 metres from apartment. No charge. Flat screen TV with HDMI outlet. Receives Spanish Freeview with many channels in English. Telves box. Multinationalprograms in various languages. Can be intermittent. Large terrace, 90m2, with terrace room equipped with small kitchen and washing machines. Loungers, table, chairs and seating furniture provided. Natural sea pools . Ideal for swimming and snorkling. Quiet, well situated comfortable appartment. Right by the sea, close to restaurants and shop. Blissfully traffic free, soothed to sleep with the sound of the waves. wonderful position, in a village I already know and am very fond of. Airy, spacious flat, with fabulous views. A few problems with the TV,& DVD, also felt the kitchen equipment a bit ungenerous, and wondered how it would be for more than two people. I do not understand the comments regarding the kitchen equipment. We went into this apartment directly after these guests and actually met them. We easily cater for 6. There is a set of dishes for 6 servings, fully equipped kitchen which includes, full cooker, hob, fridge freezer, microwave, pots and pans, utenzils, toaster, electric kettle, serving dishes etc. etc. etc. There is also a large dining table and 6 chairs. We also provide a kettle, hob, small refrigerator, toaster, washing machine, sink on the terrace. All the above were in place when we went into the apartment. Regarding the TV we checked it and found nothing wrong with it. We have Spanish Freeview which can be change to English for US or UK originated programs. We also have satellite TV through a Televes box which provides international news programs in English, Sky News, and many programs in German and some other European counties. We do not have dedicated English speaking programs from i.e. BBC or ITV. We do not advertise that we do. Regarding the DVD the wire between the DVD player and Flat Screen Digital 45inch TV may have been disconnected. The guest did not email us or called us throughout their 3 week stay regarding any issues including kitchen, DVD, or TV. The apartment is truely a jewel, it is very well looked after and the location couldn´t be better. Everything you can think of is provided, distances to local bars, restaurants and groceries shops are short and the sea and waves are to be seen and heard all the time. Communication with the owners was easy and friendly. If we ever come back to Punta Mujeres we´ll stay there again without doubt. Das Appartement ist ein echtes Juwel. Es ist top in Schuss und die Lage könnte nicht besser sein. Alles, was man im Urlaub benötigt, ist vorhanden, die Entfernungen zu den landestypischen Bars und Restaurants, sowie zu kleinen Lebensmittelläden sind kurz. Das Meer hat man immer vor Augen und nachts kann man den Wellen lauschen. Die Kommunikation mit den Vermietern war völlig unkompliziert und freundschaftlich, sollten wir jemals wieder nach Punta Mujeres reisen, werden wir wieder dieses Appartement mieten wollen. When we booked we received all the information we needed from travel details to all the facilities in our apartment. We arrived early but Diana and Doug gave us a warm welcome and a full tour of our apartment. They even brought us shopping. The views from the Terrance was amazing and it was very soothing to listen to the sea at night. We had a fabulous Terrance where we dined at night over looking the sea. The area didn't have many tourist which was good. We saw the real lanzarote.It was a great base to go and see lanzarote. Diana and Doug were there to say good bye. We will be back and I would highly recommend here. Diana and Doug keep up the great work. My husband and three year old son had a lovely relaxing time at Casa Neptune. If we didn't have a three year old we would have likely spent the first few days on the patio watching the sea change colors woth the sun. As we do have a three year old we had a ton of fun adventuring around and enjoying coming home to the cozy home and lovely views. Everything was just perfect. Thank you Dianne.